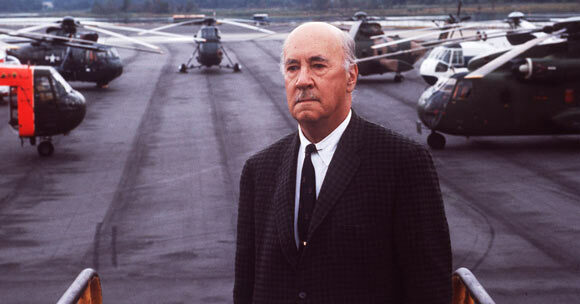 Igor Ivanovich Sikorsky, the father of helicopters, was born on May 25th, 1889. He was given this title not because he invented the helicopter but because his designs were a pioneer. He was the youngest of the five children of the Ivan’s family. His father was a Professor of Psychology and mother was a physician but never worked professionally. He belonged to a Russian and noble Polish family background. Igor developed interest in natural sciences during a conversation he had with his father when travelling to Germany. His interest encouraged him to work on experimenting with model flying machines and at an age as young as 12 he had made a small rubber band helicopter. He received his education from Saint Petersburg Imperial Russian Naval Academy but his interest in engineering drove him to leave that place and move to Paris. In 1907 he got himself enrolled at the Mechanical College of Kiev Polytechnic Institute. A year later on another trip to Germany with his father he found out about the accomplishments of the Wright Brothers Flyer. This was the turning point for him and that is when he decided that he wanted to pursue aviation. In the early 1900s, he started his work on designing a helicopter. The first two attempts failed in 1909 and 1910 as they never left the ground so he halted and turned to fixed wing aircraft till the 1930s. During that time, with financial help from his sister, he built the first four engine plane in 1913. S-1 failed but S-2 turned out to be a success. He never stopped trying and made all efforts that he could to acquire knowledge to improve his airplane models. During this time only, he also got hold of the pilot’s license. His continuous hard work paid off and his model S-5 won him national attention. He also won an award in the 1912 Moscow Aviation Exhibition. These successes promoted his appointment as the head of aviation of Russian Baltic Railroad Car Works. There, he designed the Ilia Mourometz which laid foundation for 70 versions of bombers used in World War 1. The Russian Revolution in 1917, slowed down his career. Therefore he moved to France to build bombers for the War. Two years later he went to United Sates and began teaching mathematics there. He worked day and night and saved enough money to establish his own aviation company , the Sirosky Aero Engineering Corporation, in the Long Island in 1923. The company did pretty well but Sirosky was dreaming big. All this time his dream of building a helicopter had just grown bigger and he never stopped jotting down his designs and ideas. He patented a few of them as well. By 1939 his dream came true and he achieved his goal. Igor Sikorsky finally completed VS-300 and piloted it’s first flight himself. It proved to be the most successful Helicopter of the United States. By 1940, VS-300 served as the model for all single rotor helicopters. Igor’s work contributed enormously in the aviation industry and he was recognized for it. He won many awards such as the National Medal of Science and the Wright Brothers Memorial Trophy. His name was also inducted in the Aviation Hall of Fame and International Aerospace Hall of Fame. These are just a number of recognitions that he received. He published books like “The Message of the Lord’s Prayer” and “The Invisible Encounter” before he retired from his work 1957. He died at the age of 83 on October 26th, 1972 at his home in East Connecticut.